KIEV, Ukraine -- This day five years ago, the European Union and Ukraine started negotiations on a groundbreaking new agreement with the aim of fostering Ukraine’s political association and economic integration with the E.U. A picture of Ukraine's former Prime Minister Yulia Tymoshenko at a rally in Kiev. By now, we should have been able to celebrate a signed and ratified agreement, and a successful Ukraine making progress toward even closer cooperation with the E.U. Instead, we pass a new milestone on what is becoming a much too long and painful road. In March 2007, hopes were high for a sustainable democratic development of Ukraine. Indeed, the country has been regarded as a beacon of democracy in the former Soviet Union and has a better track record of free and fair elections than most other countries in the region. This has allowed the E.U. to go for much closer relations with Ukraine and also helped pave the way for the Eastern Partnership — an ambitious policy aiming at political association and economic integration between the E.U. and its six Eastern European partners. Today, however, we are at an impasse in the association process. While negotiations on the association agreement were successfully concluded in December 2011, the way forward — through signing and ratification of the agreement — has in effect been blocked by Ukraine’s actions. Developments in Ukraine in the last two years have caused us to question Kiev’s intentions with respect to the fundamental values that underpin both the agreement and our relations in a broader sense. Following Viktor Yanukovich’s victory in 2010 in the presidential election, which was widely recognized as meeting international standards, Ukraine adopted an ambitious reform agenda, aiming mainly at boosting economic growth, alleviating the effects of the financial crisis and setting the country on a course toward deeper and closer ties with the E.U. From our side, we could only support such a strong commitment to reforms, and we strongly welcomed Ukraine’s European choice. We cannot, however, conceal our growing concerns regarding the state of democracy in Ukraine. Independent media and civil society organizations report pressure from the authorities. In late 2010, criminal proceedings were started against a number of leading opposition politicians. 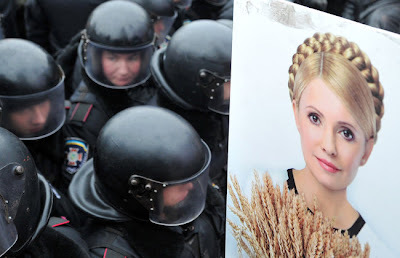 And a year later, former Prime Minister Yulia Tymoshenko was sentenced to seven years in prison for allegedly abusing her office, following a trial that has been widely criticized both in Ukraine and abroad as not meeting international standards. Moreover, more than a dozen other opposition politicians are facing similar charges. On Feb. 27, the former minister of the interior, Yuri Lutsenko, was sentenced to four years in prison after another disappointing trial. These trials bear the marks of politically motivated and selective justice. According to independent experts, they have been conducted in a manner that has failed to respect the principles of the rule of law and the human rights of the defendants. These developments are incompatible with Ukraine’s own European choice. Democracy, human rights and the rule of law are the values underpinning the association agreement and Ukraine has already committed itself to them in the framework of the O.S.C.E., the Council of Europe, and also vis-à-vis the E.U. Thus, it is fair to say that the association agreement has been imprisoned, and the Ukrainian leadership is holding the key. In October 2012, Ukrainian voters will elect a new parliament. This will be a litmus test for democracy. On that day, the eyes of the international community will be on Ukraine, with the hope and expectation that the country will not renege on its tradition of free and fair elections. This includes ensuring that the opposition is allowed to participate fully. We wish to underline that ultimately, it is the responsibility of the government to ensure that all political parties, including the opposition and its leaders, are able to participate on equal terms. We call on Ukraine to send an early invitation to the O.S.C.E. Office for Democratic Institutions and Human Rights to pave the way for a substantial international observation mission. We see ourselves as Ukraine’s allies. We believe in the people of Ukraine and in Ukraine’s democratic and economic potential. We know that the road of reforms, which Ukraine has chosen to take, is long and challenging. But we are convinced that closer political and economic ties, as well as people-to-people contacts, between the E.U. and Ukraine offer huge benefits for both partners. Twenty years of independence and sovereignty have brought an irreversible change in the mentality of the Ukrainian society. The people of Ukraine are Europeans and share European values. Our goal is to anchor Ukraine in the European family, as symbolized through the signing and ratification of the association agreement. We call on the Ukrainian leadership to display the political courage and wisdom needed for this to happen.